The Covered Life: Take Off That Scarlet "S"
There she is. That lady at church. You know the one, she corners you every time she sees you and she asks "well meaning" questions like, "Are you dating anyone?" And sometimes she says it and sometimes it's left hanging in the air unspoken, but you hear it anyway..."You aren't getting any younger." I remember that question, I heard it many times. And it stings, whether we care to admit it or not. Because in reality the answer may be out of our control. "No, I'm not dating anyone...because no one has asked me out." But instead we slap on the happy face and the "I'm Independent Banner" and say, "No, I'm not." And the truly lovely ones say, "Well you just haven't found anyone good enough for you" and the ornery ones say, "You're getting too old to be so picky." I want to tell you today, dear sister or brother, that you are not forgotten. If you are single and feel like there is this dead-end age where you can't possibly get married if you are older than that, so all hope is lost, I tell you, there is no such age! Even when I tried to make one! My aunts and mom stitched quilts for my sister and I the summer before my great aunt passed away. That Christmas, her daughter gave those quilts to my sister and I as gifts, which was so sweet. However, they were Wedding Ring quilts, meant to go on your marriage bed and neither of us were married at the time. So the quilts were placed back in their boxes until we were married. As I got older and older, I began to place an age on my quilt, telling my parents that if I wasn't married by 35 or 40 then I should just get it anyway, plus the wedding fund that they had! 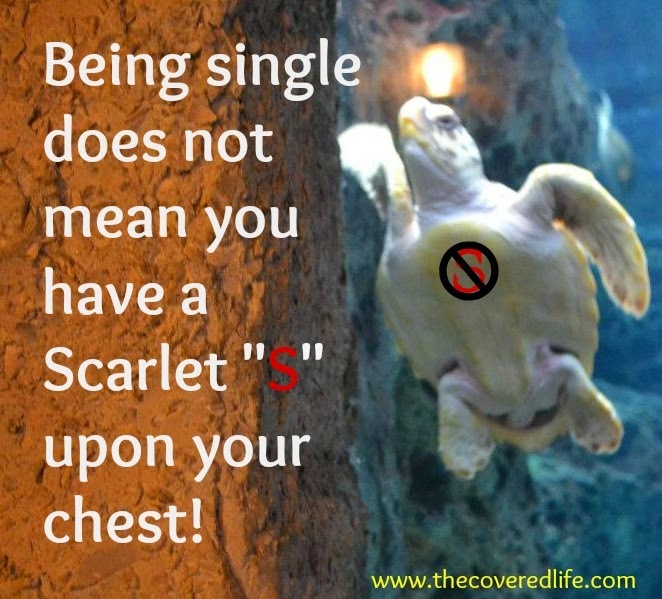 So first things first, stop viewing your singleness as a cross to bear or a scarlet "S" upon your chest. (You know like the Scarlet Letter that she had to wear in shame... just look it up if you don't know.) And start looking to Jesus. Because I actually got it wrong earlier- there really is a Prince Charming and he did come to rescue us- but not from singleness- from sin. So lean into Jesus. You don't have to be all, "Jesus is my boyfriend" because that's just awkward- instead focus on Jesus is your Lord, your King and you are treasured and loved. Please know that God hasn't forgotten you. If you are a Christian, then you are his child. Acts 17:28 He loves you. John 16:27 He knows the hairs on your head. Matthew 10:30 He knows the ache in your heart.1 John 3:20 and Acts 15:8 And He also knows the plans He has for you Jeremiah 29:11 and the work He has created for you- you specifically- to do. Ephesians 2:10 Rest in these promises and truly seek Him. And when we seek God with all of our heart, he gives us the desires of our hearts. Psalm 37:4 Beware- don't misinterpret this verse into making God a genie who grants your wishes. Because what the verse is actually saying is as we seek more and more of God (through fellowship with other believers -church, reading his word, praying) and building that relationship with Jesus then our hearts deepest desires will align with God's desires for us. And let me tell you, from experience, His plan is a WHOLE lot better than anything you can think up! As the years pass by, it's easy to start feeling this imaginary (or real) pressure to marry. To believe a lie that says you can't be happy or complete until you have your "other half". That is just bologna. My husband does not complete me, nor do I complete him. Only Jesus can complete you. Don't let others make you feel inferior or incomplete like you have this Scarlet "S" upon your chest. Run to Jesus (who was single by the way) and trust him to guide you. PS- You can also check out this post on living life now and not waiting for marriage for your life to start. **Also the Autism Fundraiser ends April 29th. If you are interested in more info, you can contact me or check out the info here.